Here is how I spent New Years Eve and Day. 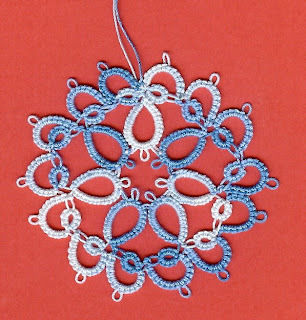 I complete two snowflakes. The first one is Jon's Quantiesque I almost ran out of thread on the last clover leaf but I managed to complete it without adding any more. I really hate to add thread at the very end of a project. It just never lays right when I do. The second motif is from my book I have been working out of. I did both in Flora thread. The first I have used and I am very happy with the thread. I have more to use and will not heistate to purchase more whenever I need some. It has been cold here all day in the low 20's I was glad I didn't need to go out. My car is still cover with snow from last Tuesday so you can see I don't get out much. I will have to clean it off tomorrow as I need to go to town. My granddaughter called last night and asked if I wouldn't make her some new pj's. Apparently she has grown out of the pair she has. I like to sew so I may have to spend the next couple of days at the sewing maching. Can't disappoint my granddaughter. She doesn't call often to ask grandma to do much. So when she does I don't want to disappoint her. Beautiful work! They are both lovely. What a nice way to celebrate the new year! 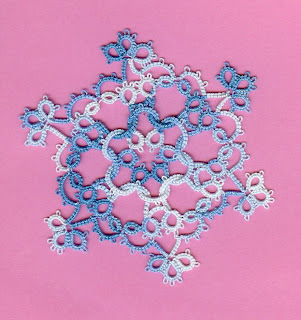 Thankk you for tatting my Quantiesque snowflake. I know the feeling of running out of thread. It happens to me often, the latest just today. This is one of those times when the Shoe-lace trick cames in handy for me. I'd like to ask your permission to make a copy of the Quantiesque snowflake and show it on my blog. I have been collecting from other tatters and adding them as I come across more of it.